Tallahassee, FL—As the camera was rolling in front of Orlando Regional Medical Center located a few blocks away from the Pulse nightclub in Orlando, CNN news reporter, Anderson Cooper, asked Attorney General Pam Bondi about how she spent tens of thousands of Florida’s taxpayers dollars—including those in the LGBTQ community—fighting to deny the right for Marriage Equality, despite the ruling for Marriage Equality handed down from the United Supreme Court. Corruption in Tallahassee is running “AMUCK.” The citizens of Florida have repeatedly petitioned for the Federal Bureau of Investigation to investigate Governor Rick Scott. Many people have questioned the ‘spontaneous’ firing of Florida’s top cop, Gerald Bailey, who headed up the Florida Department of Law Enforcement. It’s been reported that after his firing, Gerald Bailey, whose law enforcement career spanned over 25 years, said that Governor Scott wanted him to criminally target acting Orange County Clerk of Court Colleen Reilly after two inmates were said to have forged documents that lead to them being released from prison. Although Mr. Bailey refused to carry out Governor Scott’s ‘political hit’ on Colleen Reilly, citizens of Florida called for Governor Scott to be investigated. After the mother of DeShon Thomas paid DeShon’s attorney, Greg Cummings, nearly $30,000 she stopped paying Mr. Cummings and he was fired as DeShon’s attorney. DeShon’s mother learned that Mr. Cummings, along with Assistant State Attorney Jack Campbell and Second Circuit Judge James C. Hankinson were conspiring against DeShon—they were deliberately withholding evidence and denying DeShon’s the ability to exercise his constitutional rights. DeShon, who was a freshman at Tallahassee Community College, had been charged with many offenses—the most serious were Two Counts of 1st Degree Murder and Possession of a Firearm by Juvenile Delinquent. DeShon and his mother along with the rest of his family believed that a fair and just trial would without a doubt prove DeShon’s INNOCENCE. After DeShon’s mother learned that Second Judicial State Attorney Willie Meggs, whose main office is located in downtown Tallahassee, had assigned Assistant State Attorney Jack Campbell to prosecute DeShon’s case, she predicted an unfair and unjust trial. 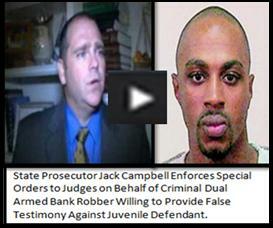 Assistant State Attorney Jack Campbell is the son of Leon County Sheriff Larry Campbell. The Leon County Sheriff’s Office were the lead investigating agency of all of the charges against DeShon—despite some of the charges being outside of their jurisdiction. After many lawyers in Tallahassee confirmed that there was nothing set by the Florida Legislature that stated that it was a bias act or that prevented an elected official (Sheriff Larry Campbell) teaming up with his son/ government employee (Assistant State Attorney Jack Campbell) from prosecuting a case together. DeShon’s mother first contacted Governor Rick Scott and Attorney General Pam Bondi requesting for a special prosecutor to be assigned to the case. Both responded by stating that they could not get involved with ongoing prosecutions. Two years later, after DeShon had not had a single pre-trial hearing—and after court appointed attorneys repeatedly were withdrawing from DeShon’s case, DeShon’s mother contacted Governor Rick Scott about Second Judicial Circuit Judge James C. Hankinson’s failures to protect DeShon’s constitutional rights. Instead of DeShon’s mother receiving any form of answer from Governor Scott’s office, Circuit Judge James Hankinson was IMMEDIATELY replaced. DeShon’s mother, a native of Orlando, used to work for the State of Florida for many years through a subcontractor when she and her family lived in Tallahassee—she is very well aware of the flow of ‘off the record’ communications between employees at other state agencies. DeShon’s mother has no doubt that someone from Governor Rick Scott’s office—if not Scott himself—informed Circuit Judge Hankinson about her complaints. Circuit Judge Jackie Fulford replaced Hankinson. DeShon was being represented by the District One Regional Counsel under Jeffery E. Lewis. Assistant State Attorney Jack Campbell recruited a ‘hit man’ against his key witness, Trentin Ross, but stated that it was DeShon’s plot. Subsequently, DeShon was convicted and sentenced to Two Life Sentences plus 30 years. After the death of Leon County Sheriff Larry Campbell, Governor Scott overlooked many of those within the Leon County Sheriff’s Office—including those with military backgrounds—and appointed Mike Wood as Leon County Sheriff. The majority of employees with the Leon County Sheriff’s Office do not have a criminal background of any sorts. Mike Wood, whose past involved criminal drug activity, had his record expunged. It has been reported that the shooter/mass murderer at the Pulse nightclub was denied admission into the police academy in part due to having a criminal record that he’d had sealed or expunged. It has also been reported that many people acted: If You See Something, Say Something. When will Floridians actions be heard. Omar Mateen terrorized over 300 people in a nightclub; Governor Rick Scott and Attorney General Pam Bondi have participated and supported Floridians—black people and white people—including those in the LGBTQ community to be terrorized for years. Today, there is a black man sitting in Tallahassee—the Leon County Jail—who has been sitting there for nearly a ten years (a decade). Second Judicial State Attorney Willie Meggs assigned Assistant State Attorney Jack Campbell to prosecute the case. An employee with the Florida Department of Law Enforcement came forward and admitted that she was instructed to withhold DNA results sent to her by the FBI. The DNA results are favorable to the defense. Both Governor Rick Scott and Attorney General Pam Bondi have severely stained Florida’s political history—they are the worse of the worst. “Injustice anywhere, is a threat to justice everywhere.” –Dr. Martin Luther King Jr.